Akilah W. Darden, MBA LEED BD+C, Project Executive for TriVersity Construction, LLC with responsibilities for establishing project objectives and policies, maintaining liaisons with prime client contracts, monitoring construction and financial activities of multiple simultaneous projects of various sizes though on-site project managers. With expertise in project delivery, successful multi-disciplinary team management, strategic client and small business development, business development, mentor and mother of four, Akilah has a proven track record for success. and institutional consisting of: a residential 406-unit condominium project in Dulles, VA, scheduling progress of a $960 million dollar hospital in Fort Belvoir, VA to over $600 million in completed projects throughout Washington, DC. The projects in DC include construction of HD Cooke Elementary School, an 11-story office building and renovation/restoration construction of the historic United Methodist Church, and renovating a research building at the National Institutes of Health in Bethesda, Maryland. Recently, Akilah has led her project team in the completion of three interior renovations with a major client in Seattle, Washington, Boise, Idaho, and two projects in Bentonville, Arkansas. While maintaining a full-time career in managing construction projects, Akilah spends time as a volunteer with ACE Mentor program at North Central High School here in Indianapolis and former mentor lead at Dunbar High School in Washington, DC. 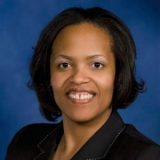 She sits on two Boards here in Indianapolis, Stand for Children and ACE Mentor program (she is now serving as Secretary for the Board). In addition, she sits on the Advisory Board for Mapleton Fall Creek Economic Development Committee. Akilah is the former Chair of Gilbane Building Company’s Employee Engagement Committee. At Gilbane, Akilah incorporated three subcommittees to handle the events of the Region to include the newly created Women’s Professional Group, Young Professionals Group, and the Social Committee. She is active with her sons’ PTA and speaks regularly to high school students about Construction, Architectural and Engineering and a panelist at the Women In Green Luncheon. In 2015, her first year in Indianapolis, Akilah was nominated for the Mentor Me award by Women in High Tech and was featured in the Indianapolis Chamber of Commerce Monday Morning Memo. Mrs. Darden was the recipient of the nationally recognized 40 Under 40 by Building Design and Construction. Akilah is the proud wife and mother of four children: three-year old identical twin girls and two boys ages seven and five. In her free time, she enjoys travelling, shopping, and cooking. Mrs. Darden has a book of poetry in the Library of Congress and had a patent pending on children’s apparel.